Disclaimer: First, my bandsaw experience is limited to a 10” Delta and a very old Craftsman, so comparison with any modern 14” bandsaw will have to come from others. Next , this isn’t going to be an exhaustive review of the 1412 since several other LJ reviews have lots of good detail that I won’t repeat. Those other LJ reviews were instrumental in my buying the 1412, plus it was on sale last month. (Actually I think it’s on sale this month too at Woodworker Supply?) Thanks to the ‘jocks’ who spent lots of time writing those. This is more of a commentary with hopes that some of the drivel below might be helpful. Packaging was great, no damage at all, the Arlington, TX Rockler folks were wonderful as usual helping me load it. The manual was actually pretty good and gave lots of good info on bandsaw setup, blade types, and bandsaw use that was sort of above and beyond. Great parts lists although a few diagrams were a bit small. Only problem I noted, and it was minor, was that at one point the assembly instructions noted that adjusting the table to be 90 deg to the blade would be ‘covered later’… It never was. A bit of headscratching and realized that the bolt stop on the bottom of the table did that, and adjustment was painless. Laguna has obviously expended extra effort with the manual. 5 stars in spite of the occasional ‘English as a second language’ giggle. I got used to “Fixings” pretty quick. Assembly went really smoothly, just no problems worth noting. My 72-year-old bad back and wanting to be able to independently get it done led me to buying and hanging a 1-ton HF chain hoist in the garage. That let me easily lift the top section of the saw onto the base, and later on position the whole thing onto the mobile base. One of the pics illustrates that. And I can now lift it up whenever I want without having to bother the neighbors or hire a couple of day-laborers! Rockler was out of the Laguna 1412 mobility kit, and I wasn’t very impressed with the quality or price of that anyway. Went with the Rockler HTC PM1000 base (400lb capacity), on sale for $34.95. So far it’s working well and I like the 4-point stance and adjustable feet. Made a couple of trips around the garage just to test it. If it breaks, I’ll go with one of the heavier HTC models and still be money ahead. Also left the $100 light kit to someone else, planning on installing an aftermarket flex-shaft LED light soon. Adjustment of the saw was easy, only problem was that the casting that holds the fence had to be shimmed just a bit to get the fence at 90deg to the table. (A shim cut from a Pepsi can was perfect.) The ceramic guides set up really easy, and I think over the long term that those are going to be a really great solution, no problem there. Love the knobs vs allen wrenches or screwdrivers! Fence adjustment; just set it parallel to the miter gauge slot and let’er rip. Setting blade tension with the ½” blade, the tension gauge ended up pointing at the 3/8” mark. Runs very smooth, no flutter at all, so just left it there. Just a comment on the table: A couple of reviews noted a bit of problem with the table at the blade slot being uneven. Happily mine was dead on perfect at the slot and flat within just a couple of .001 front to back and side to side. Blade is almost exactly centered in the table guide plate slot. Apparently Laguna was paying attention. Controls: love the blade guide height adjustment, very smooth. The tension adjustment and tension release also have a good feel. All in all, just to me feels like good quality and design. Dust collection with a 4” pipe from the HF 2hp DC was excellent. The 4” clear DC hose fit right over the dust port, but didn’t try one of the quick connect fittings. So, how does it cut? In a word, Great, especially compared to my 10” Delta (maybe not a fair comparison but all I’ve got to go on). Very limited use, so will probably update this later after more demanding use. 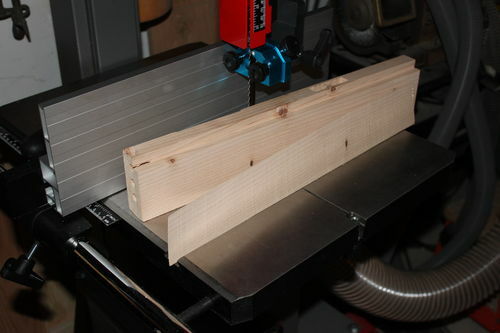 With the ½” blade ripping some douglas fir 2×4’s and 4×4’s, there was no drift, just effortless smooth cuts. (The fireworks from the ceramic blade guide were interesting, but the manual noted that it would spark a bit.) A quick resaw of a fir 2×4 on edge produced a .020” slice with only about .001” variation over the 16” length. That seems pretty good to me! Cons: No blades, no miter gauge. I went with the ½” 3-tpi and 1/4” 6-tpi Laguna Proforce blades just to get started. Woodslicer or equivalent maybe later. I already have a couple of Incra miter gauges, so no problem there. Cost: Just a skosh over $1100 with blades and the base. Bottom line, sure glad I went with the Laguna since first impression is just excellent. Hopefully the long term experience will be just as good. 1412 finds it’s place in my woodworking wall. Great review Smitty. Got mine back in June and find I’m using it much more than the old Delta. Thank you very much Smitty, great review. Only . 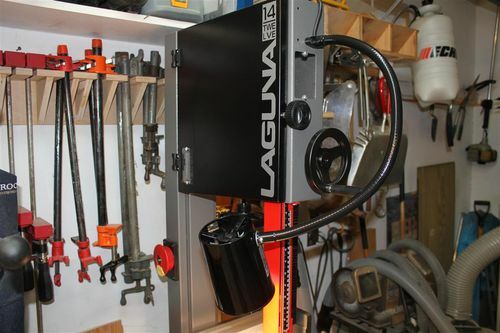 . . . . do you find the Laguna really 4 stars, even without any blade and a mitre gauge ? If you buy a car, there are wheels under it, what is a band saw without a blade ? I also am lusting after this saw. 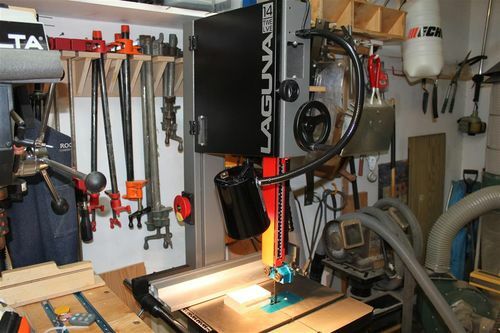 I need to sell my Jet 14” bandsaw first. Henrie, nice to hear from the Netherlands and you! Point well taken, but the miter/mitre gauge wasn’t a factor, most of the supplied ones aren’t worth much anyway. I already have several good ones to use. Seems that most seasoned bandsaw users also go with one or more upscale aftermarket blades, especially for resawing. So although lack of a blade was a bit curious, it didn’t for a moment influence selection of the Laguna, and wasn’t worth a ‘whole star’, IMO. Most miter gauges and blades that come with equipment are junk. I have three stock miter gauges kicking around the shop that never get used (thanks to my Incra HD). I’d rather save money up front and buy that stuff after the purchase (if needed). I’d rather own a car with sweet aftermarket alloys, than a car with steel rims with hubcaps. Congrats on your new bs. Thnx for your 2-cents. Reviews of any sort are always helpful. Have fun. Work/Play safe. Congratulations on your new band saw. What a great addition to your shop! Thanks for sharing and I enjoyed the pictures. Why it doesn’t have blade? That’s weird. That saw is pretty expensive but I think it’s worth it. Enjoy cutting! I got mine yesterday, I put my 15 year old jet 14” on craigslist, I got 400.00 for it…I think that is what I paid. I promptly went to woodcraft where they had a 10% sale on lagluna products. I got the mobile base for it. I did not get the light. I will get a led puck light and place it under the top door. I had a 115” bimetal 1/2” 3 tooth blade made for it at my local sharpening shop. This saw re-saws so well, I could never do it on my old saw. Congratulations! Neat to be able to have custom blades made. Has a 2 screw base, 24” flex arm, but can bolt to one of the magnetic bases so can be easily repositioned. Made in USA I think, kinda offsets our Chinese BS purchase. I think I will just get a puck light and mount under door…cheap and if it does not work well then I can look at other options. Thanks for the link though. 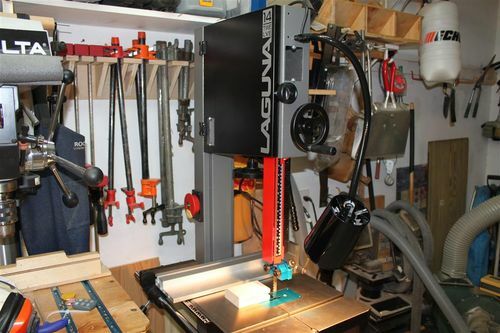 Here’s the Moffat task light mounted on the Laguna, really works well. It’s very heavy duty, has a nice toggle on/off switch, takes a standard base bulb, and made in USA. I use a Phillips 60-watt halogen flood bulb, nice ‘warm’ light which is kind to my old eyes! Best of all, it’s almost infinitely positionable to where you need the light, unlike the Laguna light kit which is fixed. 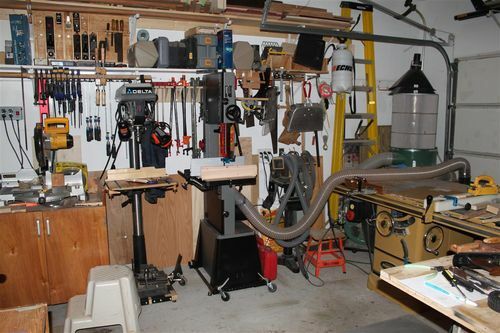 It mounts with two 1/4-20 hex sockethead machine screws and lock nuts (furnished). Had to drill a hole in my new 1412 and enlarge one of the existing holes, but didn’t mind a bit after using the light! Yep, just one of the many nice little details on this BS. I keep discovering them as I use it more.